Swagbucks has new collector bills! It's time for All That Jazz Collector Bills! 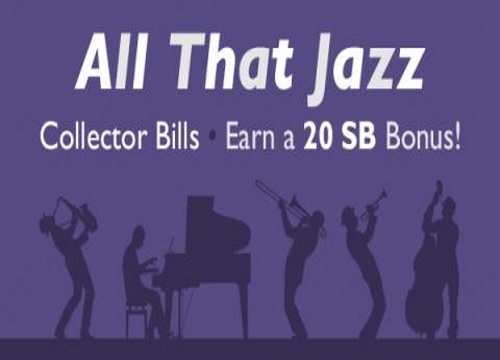 Collect all 5 jazz-themed Collector bills when you search on Swagbucks and earn a 20sb bonus! How Do I Get Collector Bills? It’s simple. Search the web through the Swagbucks Search Engine (powered by Yahoo!) starting Monday, April 4 at 12:01am PT/3:01am ET through Sunday, April 10th at 11:59pm PT/Monday, April 11 2:59am ET, and when you get a search win, you may get a special Collector Bill valued at either: 5 SB, 7 SB, 13 SB, 20 SB and 26 SB. What happens when I get a Collector Bill? When you win a limited edition Collector Bill, you’ll receive the value of the bill and the bill will be added to your “Collector’s Bill” ledger. Collect all 5 bills and you’ll instantly earn a 20 SB bonus! Is it possible to collect the same Collector Bills multiple times? Yes, you could collect any of the Collector Bills multiple times. There’s nothing like a good hitting note twice! If you're new to Swagbucks - They are the largest online rewards program around. I joined many years ago and redeem for Free Paypal money every month by simply using the site. I like sharing these promos that they have from time to time to help you earn even more. If you'd like to sign up, please use my link here. Not a Swagbucks member yet? Sign up here to get started!